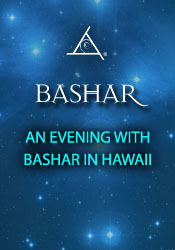 Bashar has described Hawaii as the heart chakra of the planet. In this evening of conversation with Bashar in Hawaii, he explains our energetic nature and the way we impact the electro-magnetic energy of our world through our hearts. He shares with us the benefits of being willing to change and choosing to be happy because it is your strongest desire. Q&A: Do all frequencies of light travel at the same speed? What is the speed of thought? How Bashar travels in his space ship. Unconditional love as the essence of creation itself. Synchronistic dreams with Bashar that led to coming to the event. The translation of an energy experience that happened in a parallel reality. Bashar use of memory. What is the "Ashtar Command"? .Finding your life's work. Does Bashar's species use technology in the ascension of the physical body? Does his civilization have higher level teachers? The story of enlightenment or "Shakana" in the history of Bashar's civilization. Awakening to find an inter dimensional being in the room. Following an exciting idea, but feeling resistance and lack of motivation by the amount of mundane work that seems to be involved in the project. Fear of following a dream and failing. Working with the fear, doubt and pain that comes up in the process of integrating your consciousness. Who is creating the crop circles? Feeling disconnected and how to break through the illusion that is causing that belief. Dying in a parallel reality after an accident, but remaining alive in another one. Increasing our awareness of parallel realities.